Can you believe it’s April already! It’s amazing how fast time goes. Remember when we were kids? It felt like it took FOR.EVER before my birthday would get here. And summer? Seriously, that felt like time was moving at the speed of a turtle. And now it’s already April and the first quarter of the year is almost over. It feels like it was just a couple of weeks ago that it was the first of the new year. We were all excited to start out 2015 with all these plans. We set goals of where we wanted to go and what we wanted to do. Plans and goals are great as long as you’re paying attention to what you’ve done and what’s left to work on in your big strategy plan that you spent hours typing up. To help you get ready to track your First Quarter’s goals, I pulled together a checklist to help you review your content and social sites. This assessment should give you an overview of what’s working and what needs to be tweaked. For your quarterly check-in, let me walk you through how to take an overview of your site in your Google Analytics and recap your first three months of this year. What was the Top 5 content pages for the quarter? Your content could include blog posts, sales pages and promotional content set up on your site. Now answer – what happened during this time frame to turn these pages into your top content? Did you run a promotion like a Facebook ad, shared your link in a social media group. What happened to get those numbers? Now it’s time to do some digging in your social sites. This will take more than a few minutes so make sure that you set aside enough time to really review the numbers and write down what you find in your reports. When you log into your Facebook fan page, click on the Insights button across the top section of your page. When you scroll down the page, you’ll see something that says, Your Most Recent Posts. Click on the ‘see more’ button to get more details about your other posts. I wish there was a way to request a date range but unfortunately, there’s not. You’ll just have to keep clicking the ‘see more’ button until you see your posts come up from January. Now pull out your Quarterly Check-in Worksheet and go to the Social Sites Report section. The page is set up for just ONE social site so you can print out as many as you need to cover all of your top social sites. By looking at the Reach number, which were your Top 5 posts in Facebook? In the next section, write down your engagement numbers – clicks and shares. In the last section, write down some notes about what happened to create this number. Did you share your post in a Facebook group? Did you share your post with your personal profile and a bunch of your friends commented, liked and shared it to their friends? At the top of the report, you’ll see an area where you can indicate a date range, so set it for Jan 1 – March 31. This will pull up all of your tweets for the first three months of the year. 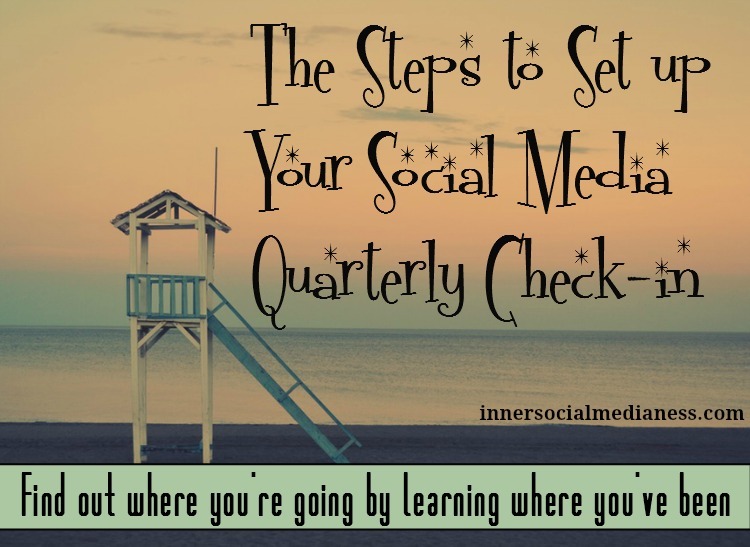 Now pull out another Quarterly Check-in Worksheet and go to the Social Sites Report section. Remember, the page is set up for just ONE social site so you can print out as many as you need to cover all of your top social sites. By looking at the Impressions numbers, which were your Top 5 tweets in Twitter? It’s a long way to scroll down to the bottom so I usually start taking a few notes of tweets and their numbers as I start moving down the page. In the next section, write down your engagement numbers. In the last section, write down some notes about what happened to create this number. Did you use a specific hashtag? OR did you get a lot of retweets and that contributed to your increase in the total impressions? To see what’s going on in your Pinterest account, log into your profile and click on the gear circle to give you a drop down list. You’ll see the analytics link located in that list. Pinterest will give you loads of information about your account but for the purpose of this report, just click on the link that will give you the breakdown for the activity coming from your site. At the top of the page you’ll see the word Impressions and you’ll see an area where you can indicate a date range. Set this for Jan 1 – March 31 to pull up your Pinterest activity for the first quarter. Now get out another Social Site Report in your Quarterly Check-in Worksheet. By looking at the Impressions numbers, which were your Top 5 pins on Pinterest? Fortunately, Pinterest gives us the top impressions from the highest to the lowest so you’ll be able to easily see your top pins from your site. In the next section, write down your engagement numbers – clicks and repins. In the last section, write down some notes about what happened to create this number. Did you share this in one of your group boards? Did this one have a certain image connected to it? And what about the pin description, did you use specific key words? After you’ve run a search for your top numbers in your social sites, take a look at your profile in the sites where you’re active. Is your bio up to date? Has anything changed that you need to remove or add to your bio information? Do you need to update your profile picture? Did you get a new headshot and forgot to switch that out with one of your sites? What about your cover photos? Are they the correct image sizes or have an old image from a program you’re not promoting anymore? By now, you should have a good idea about what’s happening to bring traffic to your website and what’s working with your social sites. It’s time to set your goals for the next 3 months. The total number of fans or followers at the time you’re working on the recap. What’s the number you’d like to see that social site get to in the next 3 months? Do a little brainstorming and write out a couple of action items that you’ll do to get to that goal. After you’ve worked through the Quarterly Check-in worksheet, you should have a better understanding of where you’ve been to help you get to where you want to go.